Zirconium implants, in some cases now provide tooth colored structure in key esthetic areas. Mini-Implants may provide options for support where there is thin or marginal bone structure under a denture. Dental implants are different than dentures, partials or bridges in that they replace foundational roots. Roots help support good jawbone structure which greatly improves stability for chewing and speaking. They even provide support for the lips, cheek and face. Once teeth are lost, bone will immediately begin to waste away, eventually leaving a collapsed appearance to the face. Implants greatly slow down the process of bone loss by returning function to the bone. In the case of a single missing tooth, it can now be conservatively replaced without permanently shaving down adjacent teeth, which is necessary when placing a conventional bridge. During a comprehensive exam, an assessment will be made by Dr. Young to determine whether or not you are a good candidate for implants. 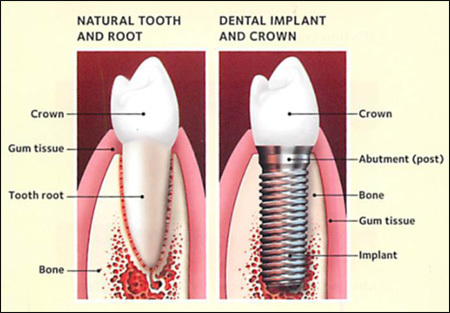 Dental implants are a great option for replacing a missing tooth, or for anchoring prosthetics replacing multiple teeth. The factor that comes into play is jawbone mass and density. Teeth that have been missing for some time may have caused a loss of jawbone mass in that area. This decreased mass may not be sufficient to hold an implant. In these cases, the patient will need one or more jawbone graft procedures to make it ready for implants. Or, mini implants could be an alternative. Otherwise, as long as the patient doesn’t have another dental issue such as gum disease, most people of all ages are good candidates for implants. First used in the U.S. in 2007, zirconia implants are fairly new as a tooth replacement alternative to titanium implants. Rather than having the implant and the post, as with titanium implants, zirconia implants are a single piece. This can make for a somewhat shorter procedure time, but it can also limit the placement of zirconia implants at an angle. Zirconia implants can be a good alternative if a patient has a reaction to titanium (which is quite rare). If you want to try dental implants that are not porcelain veneers, this option could work for you. What problems arise when a person doesn’t replace a missing tooth? Chewing and biting transfer a great deal of energy down into the tooth and through the tooth into the jawbone. This energy stimulates the jawbone to continually regenerate new bone mass. This is key to a healthy, strong, jawbone. Without that energy coming down through the tooth, the jawbone in that area begins to deteriorate and resorb. This is why older people who have been missing a number of teeth for some time can appear as if their jaw is collapsing inward. Missing teeth can be embarrassing visually, and can also create whistling sounds when pronouncing certain words. Also, missing molars can create problems with chewing, making the person avoid certain foods, which can cause nutritional deficiencies. Local anesthetic is administered to the treatment site. This reduces all sensation so there is no pain associated with the procedure. For most patients, the placement of dental implants involves two surgical procedures. First Phase: For the first procedure, implants are carefully positioned in the jawbone. For the next three to six months following surgery, the implants located under the gums tissue are gradually fusing with the jawbone. In most cases, individuals should be able to wear temporary dentures and eat a soft diet during this time. Second Phase: For the second procedure, the dentist will uncover the implants and attach small posts that protrude through the gums, functioning as anchors for either crowns or dentures. Each phase will require stitches to hold the gum tissue in its proper position while healing. The final step is the placement of the crown or the implant supported denture. The entire procedure usually requires six to eight months. Most patients experience minimal disruption in their daily life and have commented that the implant placement procedure was easier than the extraction of the tooth. As dental implants involve making a small incision in the gums, screwing a titanium implant down into the jawbone, suturing the gum incision closed, placing a post onto the implant and allowing the gums to heal again, and then finally placing the artificial tooth, patients assume it is a painful process. In reality, placing an implant is easier than extracting a tooth. First off, you’ll feel nothing during the surgery. Plus, the bone where the implant is placed doesn’t have pain-sensing nerves. After the placement of the implant, your sutured gums will have some discomfort, and there may be some aching in the chin and cheeks, but it is usually manageable with over-the-counter pain medication such as ibuprofen. An ice pack will help reduce any swelling. You’ll eat soft foods for 10-14 days to allow your gums to heal. And that’s about it. Placing the post isn’t usually painful for most patients, neither is the final step of adding the artificial tooth. While implants are typically more expensive than other methods of tooth replacement, they provide superior benefits. Implants are stronger than natural teeth and generally last 10-20 years. They are also a more favorable approach than bridgework. Unlike bridgework, they do not require removing healthy tooth structure from neighboring teeth for support. Although the root portion of dental implants lies beneath the gums, good oral care is necessary. Management of oral health with twice daily brushing, flossing at night, routine checkups and cleanings is crucial for maintaining healthy bone and gums tissue. We would love to discuss your options! Contact our office at 660.747.9117 to schedule an appointment. Ridgeview Family Dental serves Grain Valley, and Bates City thanks to our convenient locations in Warrensburg, Oak Grove and Windsor. To learn more about Dental Implants, please contact us at 660.747.9117 today to schedule an appointment.